I started a new job a few weeks ago hence the once a week posts. Sorry! I’ve adjusted easily enough back into the 8-5 routine after doing my own thing for the last 4 years. I’ve been going to bed earlier—which has been really good for me—and I’ve been waking up early-ish in order to do 15-35 minutes of yoga in the morning. For breakfast I’ve been eating oatmeal or green smoothies and last week I got the idea to bake a HUGE batch of plain oatmeal that would last me throughout the week. It has been great, especially saving time because you don’t have to watch it or worry about it boiling over. 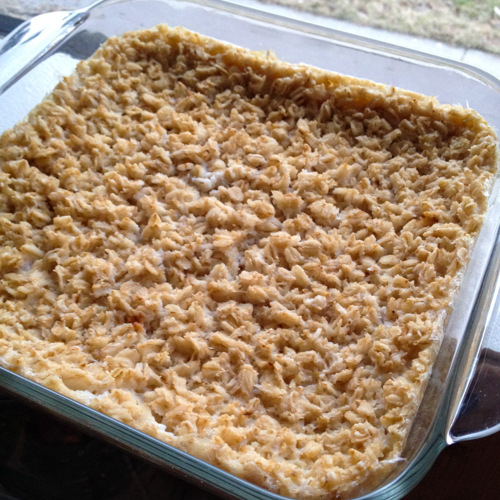 I mixed 2 cups of old-fashioned rolled oats with 4 cups of water in an 8×8 inch glass baking pan and baked in a pre-heated oven at 350ºF for 45 minutes. Then each morning I take maybe 3/4 cup and mix it with various fruit, condiments or spices from whatever we have on hand. I add a little bit of water, almond milk, or juice to add volume and break apart the congealed mass. See the above picture for the details of this week’s oatmeal eats. Most days I added a teaspoon of psyllium husk and a few teaspoons of flax seed meal for some extra heartiness.